Now if you are not yet on Linkedin you are shooting yourself in the foot. Linkedin is like Facebook but for Business owners. Here are a few reasons and Linkedin Statistics to help you see why you should join and syndicate your content to Linkedin. Linkedin Members who made between $250k-$300k are 7 times more likely to have 150+ connections then those who made less than that. And from my personal experience A WHOLE LOT LESS SPAM!! So you see people on Linkedin are high caliber business people that have the power to make buying decisions and most likely have a strong influence on their personal contacts. Now that you understand why you need to be on linkedin let’s get into how to drive traffic to your blog in 3 easy steps. Before we can start getting traffic we need to add one quick of tool to our blog. The good part is that if you are using WordPress this can be extremely easy. 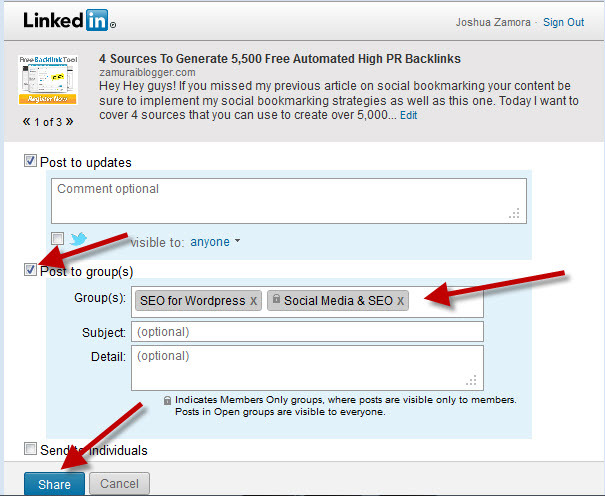 What you need to do is add the Linkedin Share Button to your blog. This can be easily done with the “DiggDigg” plugin or the “1 click retweet” plugin. Both which are free and available in your plugin directory inside your Dashboard. Once you have that set up let’s move on to step 2. Once you have the Linkedin Share Button installed you have to Log in/Sign up to your Linkedin Account and join some groups in your niche. The great part about this is regardless the niche you are in some of these groups have hundreds of thousands of members in them. You will see why this is great in step 3. One thing I do recommend is to set up a new email account for your Linkedin Profile if you do not want to receive daily updates from the groups you will be joining. If you are like me and join about 50 groups your email account will start to get pretty crowded. Once you have the share button on your blog and have joined several groups in your niche it’s time to start writing and sharing great content. Now keep in mind this WILL NOT work if you have crappy content. PERIOD! It will also piss some people off if you are syndicating squeeze pages and sales pages. I recommend you only share your blog posts or videos that contain some real value. You can even go back and share one of your old blog posts (one per day) to get some traffic to your some of your older posts. But all you have to do is go to your blog post and hit the “Linkedin Share” button. a Pop up will show up (if you are not already logged in make sure you do) that looks the image below. 3. Insert a Catchy, attention grabbing Title/headline. 4. Hit The Share Button. That is it my friend! It’s as easy as 1,2,3! If you do this correctly and for all your posts you can expect to see an extra 500-1,000 high caliber people coming to your traffic if NOT MORE! I hope this article helps you to get some more high caliber traffic. I have to admit, I’ve not been a prolific player on Linkedin even though I know I should. This is a good article, thanks for the advice on the plugin..
Hey Keith trust me neither was I. To be honest I don’t really use Linkedin much except to syndicate my content. I get on every once in a while to help a few people out but thats about it. Trust me and give it a go. It literally takes 2 seconds to publish your article into these groups that have thousands of high caliber. members. I never knew you could do that, put up your content in the groups like thank you very much. I plus 1’d your site and submitted via Onlywire for you thanks again! Hey Clint great to have you here! And yes it is a very simple process that takes just a few minutes to get some nice additional traffic. Hi Joshua, Groups are also a indirect way around the whole ‘contact only those you already know’ factors. I’ve been sharing my content (blog posts) but I wasn’t sure about adding it to groups. I’ll have to give it a try. Yes you are right Brian. Linkedin is pretty strict with who you add. Join some groups and give it a try and let me know how it goes. I never really thought about how powerful posting to groups in LinkedIn could actually be. Wow. Thanks a lot for sharing this as it definitely has sparked my imagination a bit. Up to this point I was really just going through the motions on LinkedIn and not utilizing it to its full potential. Hey Melanie, Yes it can be quite a powerful strategy especially since some of these groups have 20,000, 40,000 even 100,000+ members. I would love to hear how it goes for you. That’s a great tip Joshua but I have to admit, I don’t like setting up multiple accounts on social media site. I do find their emails annoying I must admit so I can see why that would be something to consider. Thanks for sharing this, I haven’t taken the time to really go through the groups. I’ve joined a few but ended up leaving because people started posting things that had nothing to do with the group at all. I’ll have to take more time to scout around though. You are right Adrienne it can get quite cluttered especially on linkedin since you do get daily updated from the groups. But it’s worth it and you can always set up a new email account. And yes it is a numbers game some groups are good and some are not. It’s just finding the right ones. I hope you get back into linkedin as its a very powerful social media platform. I love LinkedIn but often the integration button from my blog to their site has an error and they say try later, thanks for the information. hmm that’s weird Gee. What plugin do you have installed for the Linkedin button? It might be as easy as installing a new plugin. Really good info. I have been publishing my blog on Linkedin but I haven’t actually shared it with any of the groups I belong to. Really good info. I’ll be using your tip from now and see what results I get. Thanks for the great info. Great to hear from you Lisa 8) I’m glad to hear I can help and would love to hear how it goes for you. I’m truly glad I can help and it really is a simple way to get some additional traffic with very little time and effort. Let me know how it goes for you my friend. Linked brings me tons of traffic too! I did not know I could post to all my groups a tonce though! Thanks man! Really simple and takes just a few seconds per post. I am always eager to have more info and more points of view about backlinking. For me, personally it is hard to estimate which is better – having backlinks in different sites or having not so many of them on more popular and visited sites. Whats do you think about it? I think having a bit of both is great. Having a lot of backlinks with a mixture of low and high visited sites. But more importantly is the pagerank of the site you are linking from. I have read some people make a fortune with Linkedin traffic, personally I haven´t utilized it yet. Will keep this method in mind, only trying to figure out what niche to use. One should really take advantage of the fact that there are a lot of experts in LinkedIn that are members of communities talking about their respective niches. It’s a good opportunity to build up a good reputation along with the goals of bringing traffic to your site. Linkedin very much so I’m still learning how everything works..
Glad I can help Jan. I don’t get on linkedin much either. But I do share my articles on my blog all the time.